Our dogs are our best friends, and for most of us they very quickly become family. That’s why taking care of them is so important and for many this means taking a closer look at the diet you provide to them. For some dogs, there is an option that may have several benefits – the BARF diet. It may not be for every dog or dog owner but its benefits could mean that it is worth understanding more about and potentially adding to your dog’s health and longevity of life. “BARF” is an acronym for “Biologically Appropriate Raw Food” or “Bones And Raw Food”. Originally supported and developed by some vets, the BARF diet is adopted by pet owners around the world. It works on the central idea that dogs in their natural, evolutionary environment wouldn’t eat processed food – they’ll instead eat raw bones and meats along with some vegetables, eggs, and similar substances that they would normally find in the wild. 60 to 80 percent raw bones and meat. Most bones will have about 50% meat and 50% bone in terms of weight and mass. 20 to 40 percent fruit and vegetables. Along with these numbers, about 10% of the overall meat ratio will usually be organs – primarily liver. In the BARF diet, dog owners focus on providing their dogs with raw meats and organs from numerous animals and adding various fresh fruits, vegetables and eggs with various supplements, (dependant on the dog’s age, health, breed and size), to help simulate the stomach contents that prey animals would contain and therefore adding any vitamins and minerals that may be lacking. The main benefit that this diet is based upon is simple – Evidence has shown that if the BARF diet is followed fairly strictly, it helps create a nutritionally balanced diet filled with healthy vitamins and minerals that provide tremendous benefits to your dog while helping them avoid allergy issues and other problems that may sometimes occur with some processed pet foods. As for drawbacks, the primary one is the danger that the unknown origin of some raw foods have. The BARF diet promotes fairly strict adherence to having raw food sourced from quality, organic farming habits. Unless you are totally certain of this, you could be doing more harm than good for your precious companion due to the possible additives and chemicals that can be used to farm food! What this means is that a trip to your local supermarket for the ingredients may not suffice! Another consideration is the detrimental effect that the excess consumption of raw meat can have for some dogs. The last and most obvious drawback is simply convenience. Feeding a BARF diet means that there are additional steps to just sourcing the right ingredients. 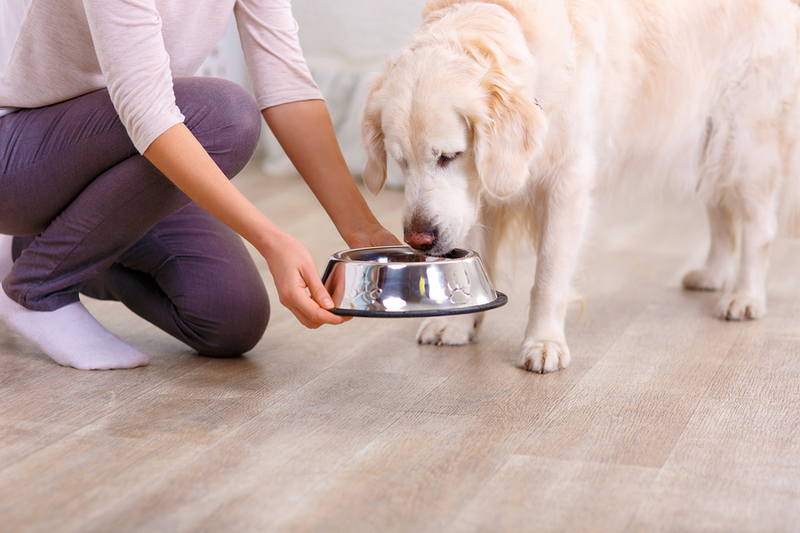 These include measuring and preparing meals with various raw foods, then the possible addition of supplements and understanding the correct balance of protein, fat and carbohydrates you have prepared for your dog, before feeding it to them. These extra steps take additional time and can create a larger amount of clutter in your kitchen and the need for storage space within your refrigerator or freezer. ranges that offer the balance of an easy to use product while still providing your favourite furry companion with the necessary vitamins and minerals in a natural and organic formula, to create a balanced meal for your dog – just make sure you choose a reputable brand that has a guaranteed analysis. Is BARF Right For My Dog? So the big question on the minds of most dog owners is this: Is the BARF diet right for your pooch? We now know that the BARF diet, done well, can add some very good benefits to your dog’s well-being. But it may be more important to ask yourself this: Is the BARF diet right for YOU and your pooch? The reason is that your dog may not be able to eat a raw food diet and then there’s the fact that you’ll likely be the one putting forth the additional effort. However, there’s another point worth considering here – purchasing pre-packaged, ready to go BARF based raw foods that are already measured and prepared without the need to freeze, thaw or refrigerate; yet still have the right balance of nutrients and with ingredients already sourced via strict quality organic farming assurances. Food like Ziwipeak is one such food that uses human grade ingredients and adds the convenience back to the process of feeding your dog but still allows you to give them the health benefits that can only come from a raw food based diet. This entry was posted in Food, Health and tagged BARF, Convenience, Healthy Diet, Raw Diet, Supplements, Ziwipeak.